An attorney delivers his closing argument in the last Missouri talc powder trial in April, which ended in a $55 million plaintiff's verdict. UPDATE: On Wednesday afternoon U.S. District Judge Jean C. Hamilton issued an order remanding the cases to state court, and next week's trial is expected to begin as planned. St. Louis - Johnson & Johnson on Friday removed to federal court what was expected to be the third state court trial over the alleged cancer risks of its talc powder products barely a week before the start of jury selection, claiming that 45 cases pending before a Missouri state court were improperly grouped together by plaintiffs in a bid to escape federal jurisdiction. Attorneys for plaintiff Deborah Giannecchini blasted the removal effort in an emergency motion for remand filed on Monday, characterizing it as an attempt to delay the state court trial scheduled for September 26 “at all costs.” Two previous St. Louis juries awarded verdicts of $72 million and $55 million earlier this year in cases filed by other women alleging talc exposure caused their ovarian cancer, and a third state court jury verdict would substantially impact the resolution of over 800 similar cases in Missouri. U.S. District Judge Jean C. Hamilton scheduled a hearing for this Wednesday to consider the remand motion. Courtroom View Network had been planning to webcast the trial gavel-to-gavel. In 2014 Judge Hamilton remanded the same batch of cases to state court after an earlier removal attempt, finding that the fraudulent misjoinder doctrine did not apply and that the cases were sufficiently similar to defeat an assertion of complete diversity and could be tried jointly. However J&J claims developments in St. Louis Circuit Court Judge Rex Burlison’s courtroom have shown that decision to be incorrect. Since Judge Hamilton’s initial remand, J&J notes that two of the 45 plaintiff’s cases have gone forward in separate trials, and that the parties were recently directed by Judge Burlison to prepare a “backup trial” in the event the Giannecchini case doesn’t go forward. “While plaintiffs allege that the claims are to be tried jointly, the reality is that their claims would never be brought or tried jointly in the ordinary course because they have no real connection to each other,” J&J argues. In an accompanying motion to stay the state court cases, J&J cites that on September 29 the Judicial Panel on Multidistrict Litigation will consider a motion for coordination of talc powder cases, and that next week’s trial should not proceed before a decision on the establishment of a talc MDL is made. In their emergency motion for remand, Giannecchini’s attorneys lambasted J&J for attempting an “end-run” around Judge Burlison, arguing that the removal attempt is untimely and that removals to federal court generally must take place within one year of a case being filed. The motion goes on to argue that the Eighth Circuit has never adopted the fraudulent misjoinder doctrine, but that even if it had, the administration of a state court docket has no bearing on whether or not the plaintiffs sought to avoid federal jurisdiction. The plaintiffs claim that J&J has “kicked and screamed to avoid multi-plaintiff trials” but now points to the fact single trials have taken place as proof that the 45 talc powder cases cannot be tried jointly. “This is the quintessential ‘gotcha’ argument,” the plaintiffs wrote. If next week’s trial is delayed, the plaintiffs suggest it will not be rescheduled until sometime next year, and that Giannecchini may have succumbed to her illness by then. They note that the plaintiff in the first Missouri talc powder trial, Jacqueline Fox, died shortly before her case went before the jury. If the remand motion is denied, it will be the second time in as many weeks that J&J has successfully scuttled a pending state court talcum powder trial. The first trial in New Jersey, where another batch of cases has been consolidated, was scheduled to begin in October, but Atlantic County Superior Court Judge Nelson Johnson dismissed the case after finding the plaintiffs lacked sufficient medical evidence to support their claims. 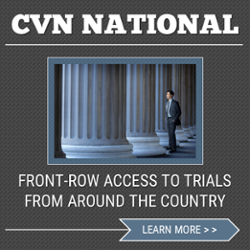 Courtroom View Network had been approved to webcast gavel-to-gavel video of both trials. If the Missouri trial proceeds as originally scheduled in state court, CVN is still planning to record the trial in full. Giannecchini is represented by Onder Shelton O’Leary & Peterson LLC. J&J is represented by HeplerBroom LLC and by Shook Hardy & Bacon LLP. The case is Tiffany Hogans, et al.v. Johnson & Johnson, et al. The case number in the U.S District Court of the Eastern District of Missouri is 16-cv-01470. The Missouri state court case number is 1422-CC09012-01.